But whereas when you or I might fancy a guess in purchasing an unusual piece of art or installing an anachronistic design element, and have the result be less than lovely, Suzanne Perilli Hancock, Rachel Johnson and Kori Korczyk actually know what they’re doing. Hancock, Johnson, and Korczyk have each earned their degrees in interior design at West Virginia University. 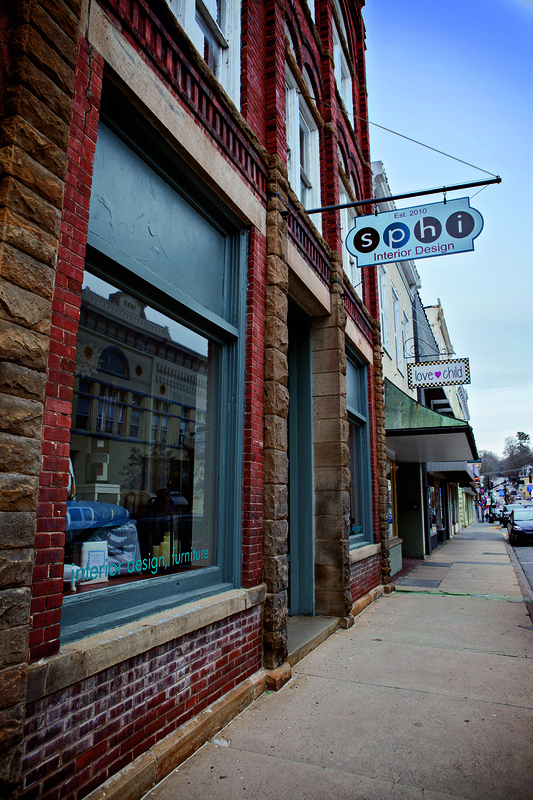 Johnson and Korczyk joined Hancock at her namesake design studio in downtown Lewisburg after receiving their degrees in 2008 and 2010, respectively. The three West Virginia natives (Hancock is from the Summersville Lake area of Nicholas County, Johnson is from Lewisburg and Korczyk hails from Beckley) have built a thriving interior design business designing homes from resort properties at the Greenbrier Sporting Club and Glade Springs to furnishing remodeled historic homes in downtown Lewisburg. But SPHI does not limit their services to multi-million dollar homeowners. Good design should be accessible to all, they say, and they make their services available to average homeowners looking to make the most of their space and investments. The key to creating a well-designed space, regardless of cost, says Hancock, is a combination of listening to clients and looking at what they like and how they live. “We get to know people pretty well,” she says. Hours of conversations with clients, looking at their inspiration boards and magazine tear sheets, creating options and combining divergent opinions between homeowners is all part of the process of designing a home where all of the occupants will be happy and comfortable, she says. Important questions must be asked: How do you relax? Where do you put your feet up? How do you cook? Entertain? Do you watch television? Where? Usually, clients just want their space to be functional and well designed. But while some may love antiques and baroque patterns, others may admire a more clean, modern aesthetic. Oftentimes, people with those divergent tastes live in the same home. “It’s interesting to work with couples,” Korczyk says. “We’re helping them blend their tastes. It’s sometimes better to find out what they don’t like in order to figure out what they do like. Johnson says that in order to help clients settle on a design, they will show them two designs for a room, the first representing one person’s tastes and the second representing the other’s. At that point, the clients can pick and choose their favorite —and not-so-favorite—aspects of each room. “Maybe, then, we’ll come back with a third design, which is a combination of the two,” she says. What are the big sticking points for homeowners? “TVs are a big conversation, and also bedding,” says Johnson, who jokes that many clients are reluctant to commit to stacking more than three pillows on their beds every morning. But, she laughs, they guide their clients through that reluctance by showing them how gorgeous a varied and rich pillowscape can be. Getting beyond clients’ preconceived notions, and their inspirations and aspirations is just the beginning. Next is where the fun begins. 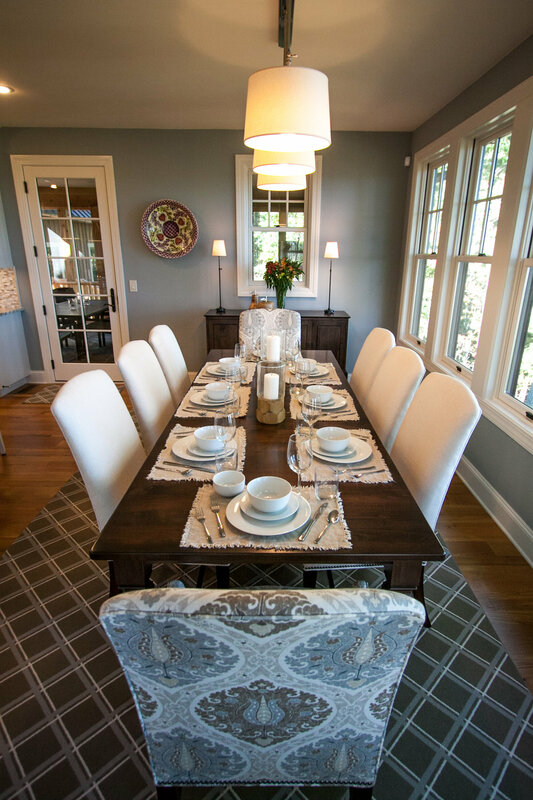 Regardless of clients’ budgets, Hancock, Johnson and Korczyk give all of their attention to the details of any well-designed home-furniture, rugs, paint, wallpaper, window treatments. While some of their clients use SPHI for full-service design of their entire home, the designers cater to a wide variety of clients. It’s not just a rich man’s service, they say. “The average person can hire an interior designer,” says Hancock. And she is by no means above working with a client with a more modest budget than the average millionaire. “Regardless who the client is, we like to visit the home and look around. We can get a feel for their design interests. We can so things like suggest paint colors and even rearrange the furniture. “A lot of times, we work in phases. We start with the den, and then, later, go on to the dining room or the master bedroom. We can point clients to a variety of resources for furniture, rugs and fabrics to hit a bunch of different price points,” Hancock says. And how does Perilli Hancock design her home? “I like warm tones. My style is traditional with updated colors. I use antiques. I like color, but I like a neutral bedroom,” she says. Hancock is not immune to the need for compromise in her home design ideas. A self-described lover of neutrals, her young child, and the West Virginia climate, has expanded the color palette in their home. “My daughter kind of dictated that expanded use of color -- that and the long winters” that can demand an infusion of bright cheer against the long, gray season. “When I worked on my home, I wanted it to be comfortable, but not casual,” she says. Korczyk, who is the youngest of the design team, says she is more exuberant in her own home’s design. Just recently, she says, she was in a furniture store and was inexplicably taken with an orange sofa. Is there now an orange sofa in the living room? Johnson says that like Korczyk, her home is a “hodgepodge” of contemporary and traditional elements. The three women are proud of the homes they live in and the business they have built in Lewisburg. They love that they are all three West Virginia natives and alumnae of the WVU interior design department and have found a way to live and work so close to home. As the three designers congregate around their giant work table in their downtown Lewisburg showroom, they are asked to share one secret about home design and living that they have learned during their careers at SPH Interiors. Perilli Hancock reiterates the need for good design and comfort. “They want their homes to be pet friendly and kid friendly,” says Johnson.